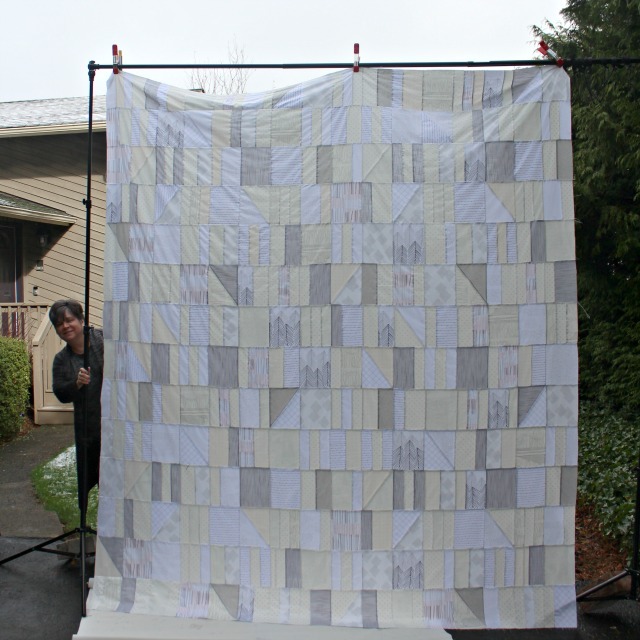 It was January 25 that I posted about A Big Bed Quilt. I had fabric I'd procured over the last several months, a pattern (finally!) chosen, and Rachel/Stitched in Color's Big Bed Quilt-Along to egg me on. I hadn't anticipated this being a beginning of the year project, but all the pieces fell into place and I went for it. I'm so pleased to say that the top is finished! I highly recommend the pattern, Sidewalk Chalk by Meghan/Then Came June. In fact, it was really fun to put together. There are several different blocks, but once you get past the half-rectangle triangles, the blocks are super simple and in geometric combinations I love. Then it's a bit of a puzzle to piece them into rows, but the kind of puzzle that totally makes sense. Wouldn't you know the largest size, Bed Size at 90" x 104", wasn't quite large enough, once I took the time to Measure Up my own bed. 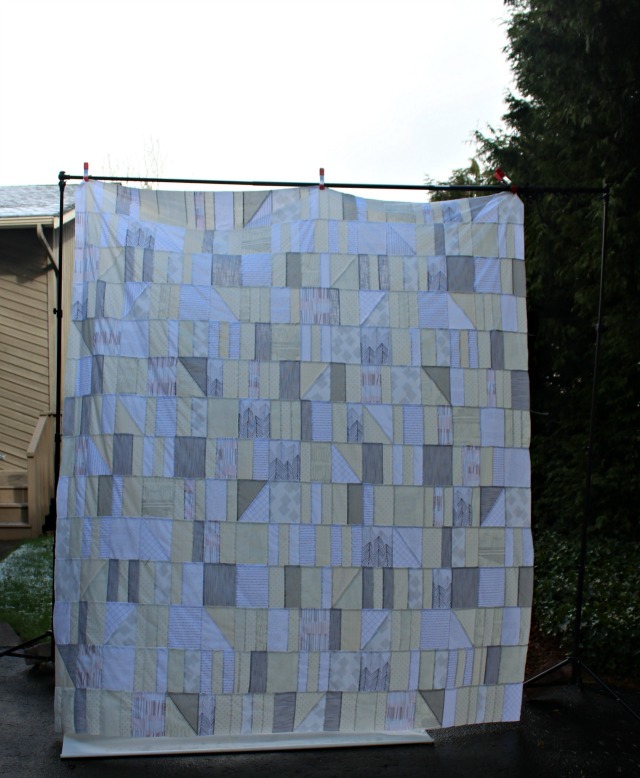 But no worries, I was able to add one extra row plus one column, which brought it up to 96" x 112", which was perfect, even considering a little shrinkage from quilting and washing. For backing, I ordered several yards of the crisscross in black wideback by Carolyn Friedlander, which is one of the low-volume fabrics in my original pull, so now I'm all set. Set for what? Set to send off to Rachel/Stitched in Color herself for long-arming. The quilt is not yet in transit, but will be soon, and I'm more than thrilled to be at this step in the process as I head off to QuiltCon. Besides finalizing decisions on thread and quilting design, I'm also anxious to see how I like the Quilter's Dream Select batting, which I have never personally tried but heard lots of good things about. So yay! I stepped from behind the quilt in this last photo - you know, for scale! The colors are a tad off, since the quilt seems less 'creamy' in person, but I'm loving the low volume. And see those trees placed throughout the quilt top? They are from the Lagom border print, and perfect, I think, for a Pacific NW quilt. Enough already. I'm shipping it off soon and will be sharing a finished quilt with you before we know it. I.love.it! nice work...I'm excited for you and to see it finished! Your quilt top looks great! And I love the inclusion of that awesome tree fabric! Great choice. 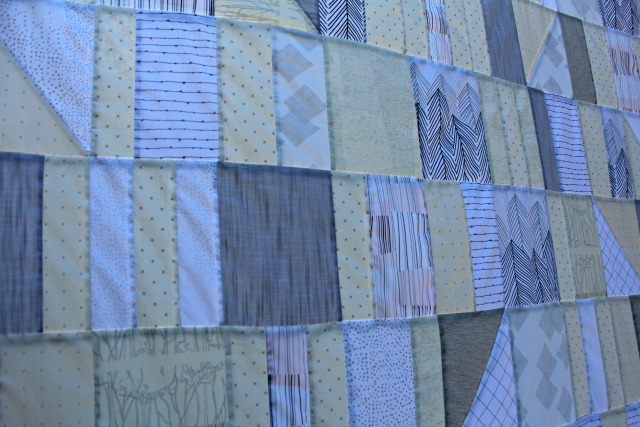 I use Quilters Dream batting and I love it - hope you do too. So fast, and so great! Seems like you were pretty inspired. Love those trees. 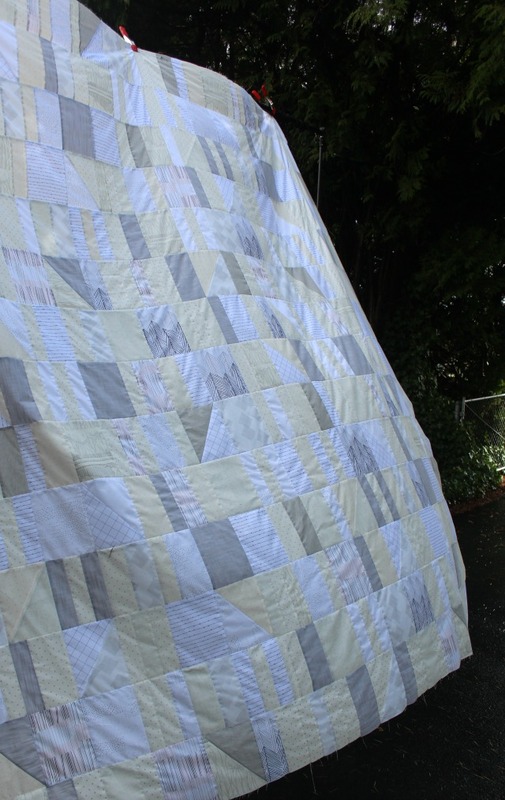 I just love the way this turned out & how exciting to have Rachel quilt it for you! See you soon! WaHoo!! Love the low volume feel. After finally finishing 2 queen sized quilts myself, I know what an accomplishment it is to get a bed size quilt done and on the bed. Wow that is awesome and huge! Love it. This is huge! A long arm worthy quilt for sure! You look so small next to it! Have fun at QuiltCon. We all can't wait to see and hear all about it! Beautiful with the greys and yellows. Looking forward to the finish and how it will look quilted. Have fun at QuiltCon! It is going to look great on your bed! Have fun at QuiltCon, hopefully I will see you next time. A kingsize accomplishment! It feels great to complete a quilt this big. Well done! I love the combo of all of the low volume prints and the quilt top is huge!! I hope to see you at QuiltCon! What a huge piece Debbie ! The last picture is really impressive. Enjoy your stay in Pasadena ! It's really great! I can't wait to see it back from the LAquilter! Yay! Your quilt is up next to quilt. I'm excited! These pictures are great. Way to use the photography equipment, haha!